As its name suggest, Virtual GPS is a tool that enables you to test GPS application. The application is able to support NMEA sentences to be used on any mapping application. 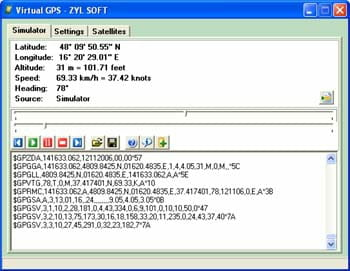 Virtual GPS supports the following GPGLL, GPGGA, GPVTG, GPRMC, GPGSA, GPGSV, GPZDA, GPWPL, GPRTE, GPAAM. It includes two modes, they are simulator mode and file mode. The application gives you the exact latitude and longitude in simulator mode. The application expires after 20 days of use.